The capital of the Czech Republic is our most valuable urban conservation area. In 1992 the historical core of the city covering 866 hectares was listed in the UNESCO World Cultural and Natural Heritage Register. 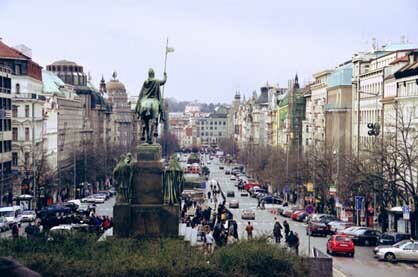 Prague was one of the nine cities awarded by the European Community the title of European City of Culture for the year 2000. The idea of the European City of Culture was coined by the then Greek Minister of Cuture Melina Mercouri. The first city to be honoured the title was Athens in 1985. The European Council highlighted the symbolism of the year 2000 when Europe saw strengthening integration efforts in all areas, by awarding the title to nine cities: Prague, Avignon (France), Bergen (Norway), Bologna (Italy), Brussels (Belgium), Helsinki (Finland), Krakow (Poland), Reykjavik (Island) and Santiago de Compostela (Spain). These cities differ in size, number of inhabitants, historic and cultural heritage as well as budget. Their differences symbolise the idea of a united Europe whose wealth lies in the diversity of regions, nations and cultures. "Praga caput regni" has been inscribed in Prague's coat of arms. And rightly so. Since the very beginning, Prague has always played an important role in the history of both the nation, country and Europe. Since the Middle Ages, Prague has been known as one of the most beautiful cities of the world, and has been attributed adjectives such as "golden", "city of hundred spires", "the crown of the world", "a stone dream". Throughout centuries, prominent personalities paid homage to it. W. A. Mozart, L. van Beethoven, F. M. Dostoyevsky, A. Rodin, G. Apollinaire, P. I. Tchaikovsky, O. Kokoschka as well as the British Queen Elizabeth II and Pope John Paul II professed their beguilement by its attractiveness and architectural beauty. Writers and poets, such as Jan Neruda, Jaroslav Hasek, Jaroslav Seifert, Franz Kafka, Max Brod and Egon Erwin Kisch featured their home town in thier works. Prague represents a unique collection of historical monuments dominated by Prague Castle which towers high above the city. It merges all artistic and architectonic styles and movements. The historical core of the city is situated on both banks of the Vltava river and consists of 6 parts - formerly independent urban units unified in the 18th century. They are as follows: Stare Mesto (Old Town), Josefov (the preserved part of the former Jewish Town - today part of the Old Town), Nove Mesto (New Town), Mala Strana (Lesser Town), Hradcany and Vysehrad. Naturally, most of the historical monuments, museums and galleries are concentrated there. A castle was built on this site in the 9th century, and a Romanesque palace was erected there in the 12th century. In the 14th century, during the rule of Charles IV, it was rebuilt in the Gothic style. 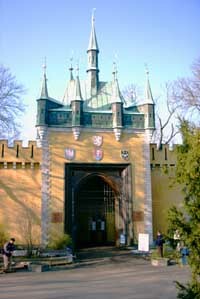 The Royal palace was re-built to the current shape under the Jagellos at the end of the 15th century, and at that time, the builder Benedikt Rejt added the now-famous Vladislav Hall, also in the Gothic style. The castle was enlarged in the 16th century, especially after a big fire in 1541. The Spanish Hall, in a new part of the castle, was added during the reign of Rudolf II, and it took its final form during the reign of Empress Maria Theresa, under the direction of the architect M. Pacassi. After World War I, the interior and gardens of the castle were renovated by architect J. Plecnik. Today, the Castle is the seat of the President of the Czech Republic, and it serves as the historical and political centre of both the city and state. The Old Royal Palace served as the residence of Bohemian princes and kings until the 16th century. It was built upon the relics of a Romanesque palace of Prince Sobeslav. 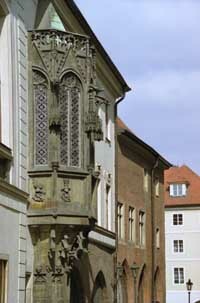 Additional reconstructions in the Gothic and Renaissance styles were initiated by famous Czech kings Premysl Otakar II, Charles IV, Wenceslas IV and Vladislav Jagello. Its most noteworthy part is the Gothic Vladislav Hall - the largest profane hall of medieval Prague (1487 - 1500, Benedikt Rejt) with a remarkable rounded rib vault, today the venue of presidential elections and ceremonial events. 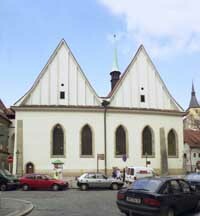 Today the oldest sacral building of the Prague Castle. A Romanesque basilica was founded in AD 920 near a Benedictine monastery, and rebuilt in the 10th and the 12th centuries. Founded in AD 973 by Prince Boleslav and his sister Mlada for the Benedictine Order. Dissolved in 1782, renovated and reopened in 1976 as part of the National Gallery. Now contains collections of old Czech art. The gallery was built in the 1960's in the place of what once were royal stables at Prague Castle. Besides paintings from Rudolf II's collections, many of which were rediscovered and identified only in 1961-62, the gallery displays works by Tizian, Tintoretto, Rubens, Czech Baroque Art and others. The Pernstein family began construction of this palace in the mid-16th century. In 1627, it became the property of Polyxena of Lobkovic and was rebuilt in 1651-68 by Carlo Lurago to the current shape. Since 1983, it has been part of the National Museum, containing monuments of Czech history including copies of the crown jewels. 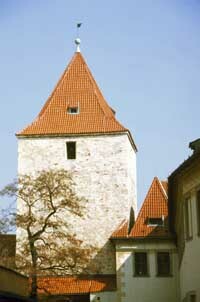 The tower with a diameter of 20 m was built in the 15th century as part of the castle fortifications. It was used in different periods as gunpowder store. At present, it houses exhibitions of medieval arts and crafts, astrology and alchemy from the time of Rudolf II. Small houses built in the gothic fortification, the homes of 16th century castle riflemen and craftsmen. Between 1916 - 1917, Franz Kafka lived in No. 22. A military tower built in 1496 by Benedict Rejt as part of the castle fortifications, and used as a jail until the end of the 18th century. It was named after the first prisoner, Dalibor of Kozojedy. It was this Dalibor's story which was put to music by Bedrich Smetana in his opera Dalibor (1868). Perhaps the most remarkable Renaissance building in Prague. The palace was designed by Paolo della Stella and built between 1535-1537 but not finished until 1557-63 by architect B. Wohlmut. The famous Singing Fountain which makes sound resembling music, is located in the garden and was designed and cast by Tomas Jaros in 1564-68. The palace hosts arts exhibitions. A Renaissance building with graffito decorations situated in the Royal Garden. It was used as barracks at one time, nowadays it is an exhibition and concert hall. The Royal Garden was founded in 1534. South Gardens - Paradise, On the Bastion, On the Riding Hall Terrace, Upper and Lower Deer Gully and Masaryk Vista. The gardens open at 10 a.m. by fanfares from the Hartig Music Pavilion. Opening hours: The Prague Castle premises are open to public daily from 5 a.m. till 12 p.m. (April to October), and from 5 a.m. till 11 p.m. (November to March), respectively. Guards at the Castle gates change every hour during the opening hours of the castle, with fanfares and banner exchange at noon. All of the Prague Castle sights are open daily from 9 a.m. till 5 p.m. (April to October), and from 9 a.m. till 4 p.m. (November to March), Prague Castle Gardens are open daily from 10 a.m. till 6 p.m. (April to October). This former place of pilgrimage with a copy of Santa Casa was built in 1626-31, and the Baroque Church of the Nativity of Our Lord was added in 1734-35. The façade of the front wing was rebuilt by K. I. Dienzenhofer in 1720-22. The tower contains 27 Loreto bells which play a Marian song We Greet You a Thousand Times (every hour from 8 a.m. to 6 p.m.). The most valuable item of the liturgical treasury is the so-called Prague Sun, a monstrance weighing over 12 kg and embellished with 6,222 diamonds. Open daily, except Mondays, from 9 a.m. to 12.15 p.m., and from 1 p.m. to 4.30 p.m.
A Monastery of the Premonstratensian Order at Strahov, built originally in the Romanesque style, including the Church of Our Lady and the Strahov Library. The Library contains an early Baroque Theological Hall from 1671-79 and a Classicist Philosophical Hall dating from 1785-94, decorated with frescoes by A. Maulbertsch. Open daily from 9 a.m. to 12 a.m. and from 1 p.m. to 5 p.m.
A reduced copy of the Eiffel Tower (60 m high) built in 1891 on the occasion of the 1891 Jubilee Exhibition. 299 steps lead up to the top platform. August 10 a.m. - 7 p.m.
September to October 10 a.m. - 6 p.m.
A maze of mirrors set up originally for the Jubilee Exhibition (1891) and featuring a diorama of "Battle of the Praguers with the Swedes in 1648 at the Charles Bridge". 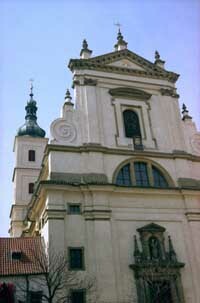 This church, built in the period of 1704-55, is the most significant historical structure of the so-called Prague Baroque. The architects were G. Santini, K. I. Dienzenhofer, and A. Lurago. W. A. Mozart played the organ there during his stay in Prague. 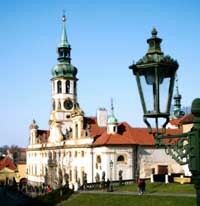 The belfry offers a view of the Lesser Town and an exposition "Music of Prague Lofts" is situated there. The Church: daily: 9 a.m. - 4.30 p.m.
November-March: Saturday and Sunday 10 a.m. - 5 p.m.
An early Baroque structure, built in 1611, and rebuilt in 1644, this church is famous for its wax effigy known as the Prague Infant Jesus donated by Polyxena of Lobkovic and brought to Prague at the end of the 16th century. Geometrically designed, this garden was created in 1623-29 and features a spectacular salla terrena, a small lake, a cave with artificial stalactites and stalagmites, and plenty of roses, rhododendrons, magnolias and Japan cherry trees. The statues are copies of originals by Adrian de Vries from 1626-27. April and October 10 a.m. - 6 p.m.
May - September: 9 a.m. - 7 p.m.
A large palace complex, the first monumental profane baroque building in Prague built for Albrecht of Wallenstein between 1623 and 1630. Today, the palace houses the Upper House of Czech Parliament, the Senate. Saturdays and Sundays 10 a.m. - 4 p.m. 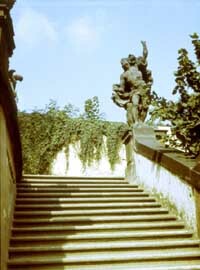 This terrace Baroque garden was designed by architect F. M. Kanka. It is remarkable for statues by Matthias Braun. April - October: daily 10 a.m. - 6 p.m.
Ledebur Garden - a baroque terrace garden founded in the first third of the 18th century, later adapted apparently according to the plans of I. J. Palliardi. A salla terrena and a fountain with a statue of a Gigant in the centre. Small Palffy Garden - founded on terraces during the first half of the 18th century, additionally fitted with a staircase. In 1997, after a major renovation, joined to the Great Palffy Garden. gardens dating from late Baroque and early Classicism period were open, too. September - October 10 a.m. - 6 p.m.
July - August 10 a.m. - 8 p.m.
Of the two towers, the lower one was built in the Romanesque style and dates from the 12th century. It is a remnant of the former Judith Bridge. The higher tower is 200 years younger and was erected in the 15th century. 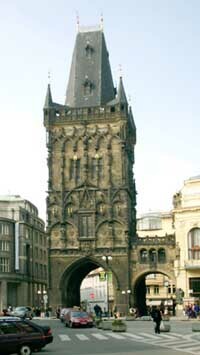 April - October: from 10 a.m. to 6 p.m.
From the history of Charles bridge. Dating from the 12th century, the square has witnessed many a significant event. Beside the Old Town Hall and the Church of Our Lady before Tyn, the square has several other dominants - the baroque St. Nicholas church (K. I. Dienzenhofer, 1732 - 1735), the rococo Kinsky palace housing the National Gallery graphic collection, the Stone Bell house - a gothic palace from the 14th century, now the Municipal Gallery concert and exhibition rooms, as well as the Master Jan Hus Memorial sculptured by Ladislav Saloun (1915). The square witnessed the execution of 27 Czech noblemen on 21 June, 1621 - in memory of that event, 27 crosses are marked in the pavement. The Prague meridian can be seen not far from therere. 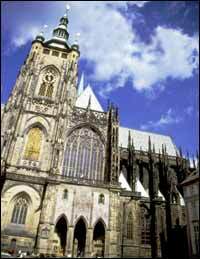 Second only to the St. Vitus Cathedral, it is the most remarkable Gothic church with a Baroque interior in Prague. It contains the tomb of famous astronomer Tycho de Brahe. Part of the iterior is being renovated at present. One of the places of a great historical value. A block of houses between the Tynska, Stupartska and Mala Stupartska streets. It probably dates back to the 11th century. Originally a fortified merchant yard where the duty on goods called ungelt (the whole area was given this name) was collected. Traces of all important architectural styles that appeared in Prague can be found in Ungelt. The most important building is the Granovsky Palace - one of the best preserved renaissance jewells in Prague. Between the years 1984 and 1996 the whole area was thoroughly renovated. Today it is used as a cultural, shopping and administrative centre. 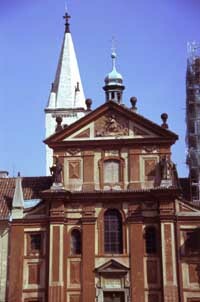 The oldest preserved synagogue in Central Europe. It was built in the early Gothic style in the late 13th century and richly adorned by stonework. Also the inside furnishings (gothic wrought-iron grill, wrought chandeliers) are of ancient origin. 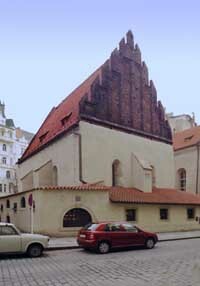 Up till now it has served as a house of prayer and the main synagogue of the Prague Jewish community. April-October: daily except Saturdays and Jewish holidays 9.30 a.m.-6 p.m., Fridays till 5 p.m.
November-March: daily except Saturdays and Jewish holidays 9.30 a.m.-5 p.m., Fridays till 2 p.m. Established in the mid-15th century it served as a burial site till 1787. 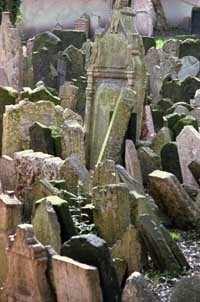 Among 12 000 gothic, renaisance and baroque tombstones are also those of Rabbi Jehuda Loew (1609) and Mordechai Maisel (1601). Permanent exhibition: A memorial to 77 297 Holocaust victims. Drawings of childern from the Terezin concentration camp. 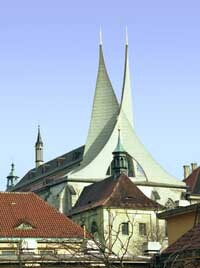 The neo-Gothic synagogue replaced the original Renaissance building built by Maisel and destroyed by fire. Permanent exhibition: History of the Jews in Bohemia and Moravia between the 10th and 18th centuries. A Baroque building near the cemetery entrance. Permanent exhibition: Jewish customs and traditions. Jewish customs and traditions. The Flow of Life. Named after its Moorish interior. Permanent exhibition: History of the Jews in Bohemia and Moravia since their emancipation until now. A Gothic building from 1475 erected by Matthias Rejsek, and once probably used to store gunpowder. Modified in 1875-86. April-October: 10 a.m. - 6 p.m.
An Art Noveau building constructed in 1905 - 1911 (A. Balsanek, O. Polivka) on the site of the former king's court, a seat of the kings of Bohemia from the end of the 14th century until 1438. The rich interior and exterior decorations are the works of A. Mucha, M. Svabinsky, J. V. Myslbek, and others. The monumental Smetana concert hall forms the centre of the building being the place of the International Music Festival Prazske Jaro (Prague Spring), other concerts and important social events. Guided tours - inquiries phone 2200 2100, and the inquiry centre of Obecni dum. Originally a Gothic chapel dating from 1391. The famous religious reformer Master Jan Hus preached there. Completely damaged, the building was reconstructed in 1950-53 based on old engravings and pictures (architect J. Fragner). April - October: 9 a.m. - 6 p.m.
November - March: 9 a.m. - 5 p.m. Opened in 1783 as the Nostic Theatre. The premiere of Mozart's opera Don Giovanni was given here on October 29, 1787. 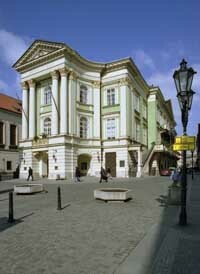 From 1799 the theatre belonged to the Czech Estates. On December 21, 1834, the song "Kde domov muj" (O, Homeland Mine) which later became the Czech national anthem, was premiered there. Today hosts drama, opera and ballet performances. The most precious "burgess house" dating from the Middle Ages. Originally Romanesque, later rebuilt in the Gothic style. 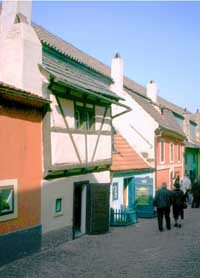 A two-storey façade dating from the 14th century, renovated in 1988. Currently, it serves as an exhibition and concert hall. For more details see the Galleries section. The original Charles University building, established in 1348. 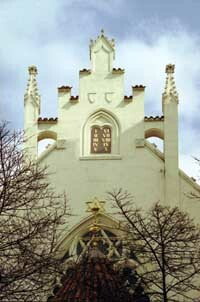 A Gothic bay chapel from 1370 was rebuilt in the Baroque style in 1718. 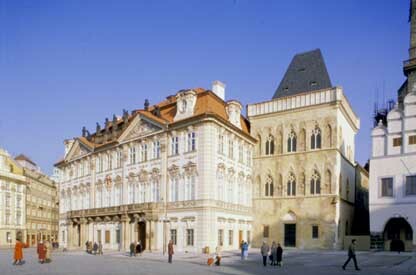 At present, Charles University graduation ceremonies take place there. There is a gallery on the ground-floor. Prague's centre of commerce. The upper part of the square is dominated by a statue of the main patron saint of the Czech lands, St. Wenceslas and four other Czech patron saints (St. Prokop, St. Adalbert, St. Ludmila and St. Agnes) by Josef Vaclav Myslbek. Erected in 1912. A neo-Renaissance building designed by architect Josef Schulz in 1885-90. Prague 1, Narodni trida 2 A neo-Renaissance building of 1868-81, built to plans of J. Zitek. A fire destroyed much of the building in its first year of existence. It was rebuilt by architect Josef Schulz in 1883 and underwent a thorough renovation a hundred years later. The authors of both exterior and interior decorations are artists of the so-called National Theatre generation: M. Ales, F. Zenisek, V. Hynais, J. V. Myslbek, and others. 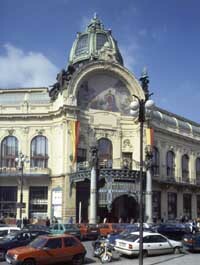 The National Theatre is a major Czech stage and its repertoire includes drama, opera and ballet. A complex of Gothic buildings dating from the late 14th and early 15th centuries, rebuilt in the Renaissance style in the 16th century. It contains a tower with the Chapel of Our Lady, two Gothic halls with ribbed vaults and a Renaissance hall. During the period between 1377 and 1784, the seat of the New Town authorities. On 30th July, 1419, the scene of the defenestration of Catholic aldermen by Prague Hussites which marked the beginning of the Hussite revolution. the halls are open during exhibitions daily except Mondays 10 a.m. - 5.30 p.m. The ancient seat of the Premyslide princes built on a rock over the river Vltava. The oldest building there is the rotunda of St. Martin. 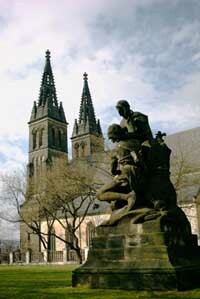 The main landmark of Vysehrad is the St. Peter and Paul cathedral. In its vicinity, there is a residence for canons, casemates, a park, and a cemetery called Slavin with tombs of famous personalities of Czech culture. The Southern part of the fortifications offers a beautiful view of Prague. Vysehrad is open to public round the clock. April - October: 9.30 a.m. - 6.00 p.m.
November - March: 9.30 a.m. - 5.00 p.m. The equestrian statue of the Hussite leader based on B. Kafka's model, cast in 1946 and erected in 1950. It is listed as the biggest bronze equestrian statue by UNESCO. 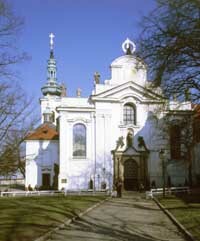 A monastery established in 993 by Prince Boleslav II and bishop Vojtech (Adalbert). Today's shape of the premises including the St. Margaret church, a convent and a prelate house were built by K. I. Dienzenhofer between 1708 - 1745 in a high Baroque style. Originally built as a pavilion for the Jubilee Exhibition in 1891. One of the most valuable art-nouveau historical monuments in Prague. The steel arch structure is 238 meters long with a 51-metre tower in the middle. The palace is accessible during exhibitions, trade fairs and other events. July to September: daily 10 a.m. - 6 p.m.